In Hans Christian Andersen’s fairy tale, The Most Incredible Thing is first a clock with magnificent visions that appear at each strike of the hour, before the malicious act of destroying the clock is reluctantly acknowledged as being an even more incredible thing. The prize of half the kingdom and a gorgeous princess goes not to the clock’s creator but to its destroyer (although, as in all good fairy stories, the villain gets his come-uppance when good triumphs over evil). The Pet Shop Boys’ concept of a ballet based on this slight fable has now returned in a second iteration with significant changes to structure, choreography and designs having been made to the original, which premiered at Sadler’s Wells, last year. Thankfully, this was not a case of life imitating art, since far from destroying The Most Incredible Thing these revisions are generally an improvement, dropping an interval and providing a tighter, pacier narrative. The excellence of Tennant & Lowe’s score was always evident but the main impetus for this new, improved ballet is a greater integration of choreography, music, designs and video animation out of which emerges a more holistic package. The most dramatic alterations come in the two long sequences that portray the contest to find the most incredible thing and then articulate the magnificence of the magical clock. In a nutshell, there is now more dance and less comedic acting. A welcome addition is a passage, known as the King’s Lament, which brings more pathos to the consequences of the clock’s destruction and strengthens the relationship between King and daughter. Taken in isolation not every revision is a change for the better (some of the silhouetted portrayals of competition entries were distinctly underwhelming and lacked the humour of the original) but viewed as a whole the overall dynamic is much improved. Although it means bringing the curtain down in the middle of what was Act 2, moving into an interval immediately after the clock’s twelve visions worked particularly well. Most of the original cast were back to reprise their roles. The clockmaker, Leo, was played again by Aaron Sillis as a New Romantic hunk, a free spirit in a nation full of grey drones and jackbooted thugs (now made more nerdily heroic by the addition of thick-rimmed spectacles – shades of ‘Some Like it Hip Hop’s Simeon Sun). Clemmie Sveaas is once again the princess who inspires Leo to succeed in making the most incredible thing while leaving us in no doubt that she is a prize well worth the effort! And Ivan Putrov is a very good, very bad, slimy SS-style villain. Having hardly seen him dance for two years, he is now becoming a permanent fixture at Sadler’s Wells, here headlining his third show in two months – from Men in Motion to the Man in Black. A strong support ensemble includes Charlotte Broom, Lisa Welham and Luke Jackson (a finalist, last year, in So You Think You Can Dance, the TV dance competition in which Javier De Frutos was a guest choreographer). 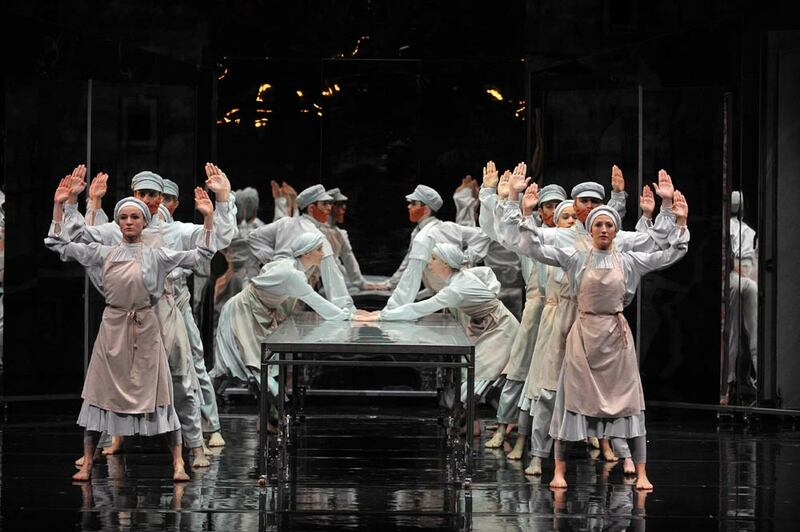 This ballet gained De Frutos a nomination for Best Modern Choreography in the 2011 National Dance Awards. It must have been a difficult choice for critics to decide whether to honour it as a modern or classical work. Certainly the two pas de deux between Sillis and Sveaas are composed from a neo-classical palette (and danced to an especially memorable theme) and there are several iconic references to ballet classics, from the obvious (such as the layered girls’ heads of Les Noces) to the more evocative (the dance for Sillis and the three muses conveying a strong scent of Balanchine’s Apollo). The score is surely any choreographer’s dream and De Frutos has revisited this revival to make amendments with style and purpose, and in so doing the production is evolving into an excellent example of ongoing artistic collaboration. I was taken by how well the first iteration of the ballet suited television (when later screened on BBC4) but now it has grown into suiting the stage just as well.